Just before I signed the receipt of delivery for our 2015 Sprinter 2500 4x4 RB-150. I'll try and get some better pics and a review up soon. Nice looking rig. Have fun! First trip to the woods. Looks GREAT!! 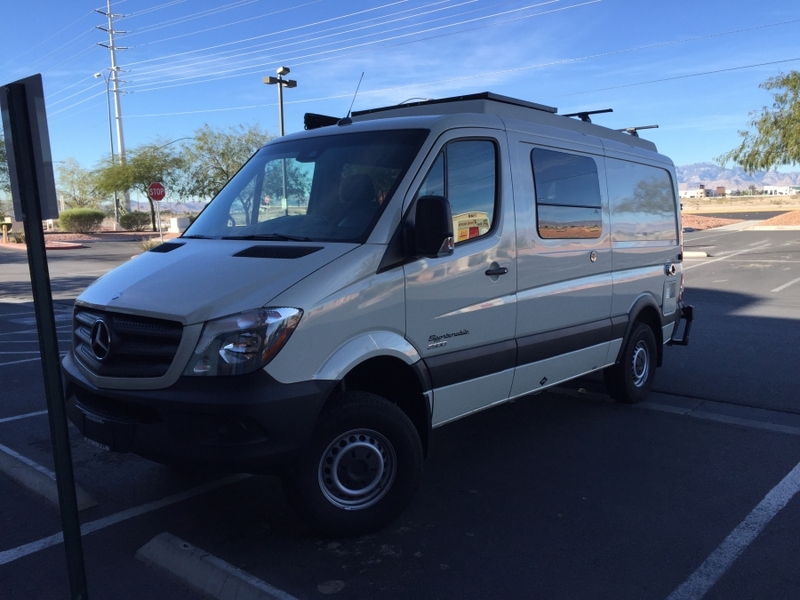 Another SMB 4x4 Sprinter owner just posted a pic of her first trip out in it...As I was saying to her, man of us will anxiously be waiting for pics of your adventures i.e.. roads you take, using the 4x4, all the good things once we Econoline 4x4 users have to move on (sort of speak)...it is the best looking and I am sure, the best performing of the news/latest van choices! Look forward to many 'views' on your trip reports! Thanks in advance!! How is the solar panel attached? I am trying to decide on solid glass vs. flex with the constraint of wanting to load the 17' canoe over the top.